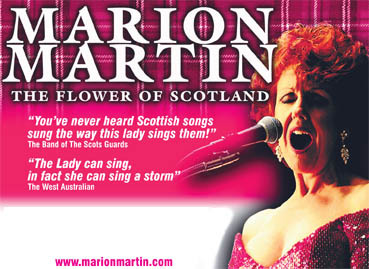 Marion Martin is widely acclaimed as one of the the most exciting and dynamic singers Scotland has ever produced! Her award winning recordings have sold non-stop, worldwide, for more than a quarter of a century! Why? Because no one before or since has sung the beautiful songs of Bonnie Scotland with such passion, such intensity or with such an exquisitely beautiful voice. On stage Marion Martin is the consummate entertainer - stunning, captivating, witty and warm; her lilting Scottish accent and bewitching Highland charm consistently wins the hearts and minds of delighted audiences worldwide. Her live performance features many of the beautiful Scottish songs she has recorded so successfully; long before Celtic woman was a glimmer in some recording executives mind, Marion Martin was breaking new ground by taking Celtic music into the commercial recording charts. Marion’s ‘Flower of Scotland’ concert is vibrant and innovative and includes hilariously brilliant impersonations. But it is the songs of Scotland that she is famous for and it is her beautiful, sublime voice and unique interpretation of these songs that reaches the heart and soul of every listener. 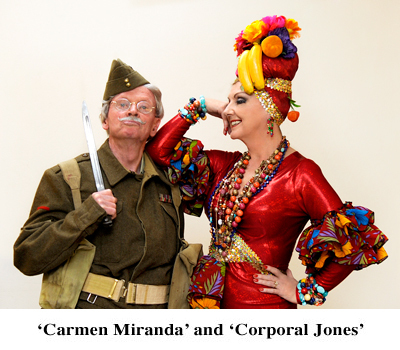 Hips, Harmony and Hitler is a stirring spectacle driven by unforgettable tunes and glamour, along with colourful costuming and the unique talents and distinctive personalities of ‘Our Gracie’ (Gracie Fields), ‘Marlene’ (Marlene Dietrich) and the ‘Brazilian Bombshell’ (Carmen Miranda), all brought to life onstage by Marion Martin in a performance that holds your attention from start to finish. The music is touching and engaging, and Marion’s portrayal of the characters makes it an act you won’t want to miss. The show pays homage to a bleak time in our history while simultaneously reminding us about the vital role these three extraordinary women played in the momentous business of uplifting public morale during the darkest days of World War II. The footage of World War II adds to the excitement of the show, but it’s the music itself that truly soars as its marvellously talented leading lady unleashes the kind of vocal magic that needs no bolstering. Marion Martin brings these personalities, the glamour, excitement and the voices of Gracie, Marlene and Carmen splendidly to life and sweeps you away to a time nostalgically remembered by many. Wonderfully realised by Marion Martin’s irresistible and sophisticated performance, one magnificent song after another completely captures the mood and spirit of an extraordinary time and three extraordinary women. It’s an overwhelming success!